​The ELEAGUE Street Fighter V Invitational moves into the final week of group play in the $250,000 competition, with Group D taking place at 3 p.m. ET Friday on Twitch and coverage on TBS at 11 p.m. Ahead of the group play, Fujimura Atsushi, Tatsuya Haitani. Seon-woo “Infiltration” Lee, Derek “Idom” Ruffin, Daigo Umehara and Ryan “Filipino Champ” Ramirez shared their thoughts on the competition and more. For Idom, this marks the biggest stage on which he's competed, but he had some advice from fellow Next Level Battle Circuit members Victor "Punk" Woodley and Bryant "Smug" Huggin. When asked about his lack of experience against international players and how he prepared, Idom said, "I talked to Punk and Smug because they play a lot of internationals way more than me. They said just play them like you play anyone else and you should do good." Everyone in this group might need to follow this advice as the players were in agreement that everyone is a threat and has the ability to advance. Fujimura, Idom, and Infiltration were specifically mentioned by name when the group was asked to narrow down their potential threats. 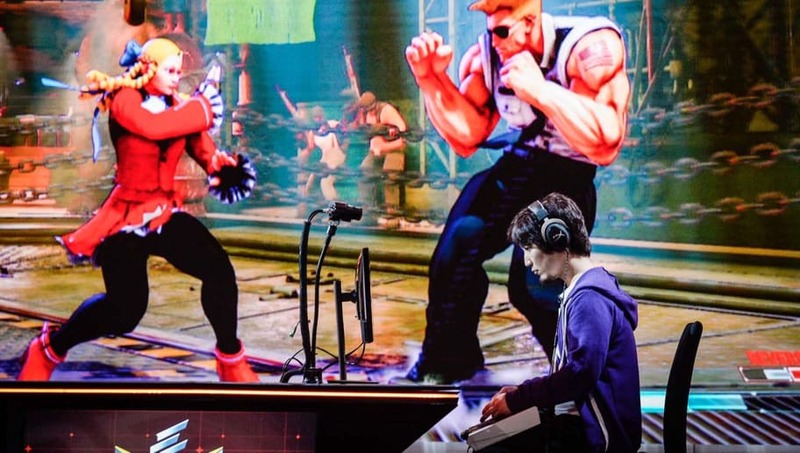 Surprisingly, Daigo wasn't named as a threat, but if he feels as charged up as he did in his semifinals match with Hiroyuki "Eita" Nagata at ELEAGUE last year, he could become a contender. In Daigo's match to qualify for the playoffs at ELEAGUE last year, he said it "brought him back to the old days, when the only thing on the line was pride." When asked to explain what brought about that response, Daigo pointed out that a combination of SFV being on the big ELEAGUE stage for the first time, TV coverage, and the stakes made everyone, including eventual winner Punk, nervous. "It was a lot to take on for all of us in the community," Daigo said. "Everyone had to fight against this big pressure. Against Eita, however, he was the only one who was able to shut off that pressure and I was able to bring myself back to the old days, where we fought against each other in arcades. No money, no fame, nothing at stake, but our pride. I was able to focus on that match against him because he was presenting himself that way. I was extremely happy with that." "It's very important to have a mixture of double elim tournaments, which are open brackets and invitationals," FChamp said. "I think its good for the scene." Outside of the high production values, the money gives players a lot of opportunity to improve as people, players and community members. Infiltration stated that his goal with the money would be to finding a place for the next generation of Korean FGC players. Idom echoed those thoughts and added that traveling the world would be his use of the money. Both Fudoh members, Haitani and Fujimura focused on family as a use for the money with Fujimura looking to save for his wedding and Haitani looking to buy his wife a bigger place. When all was said and done, the "Group of Death" has a good awareness of their abilities and the test ahead of them. They seem grounded in their approach to fighting games. Idom's closing statement for the interview summed up one of the most crucial aspects of growing up in the FGC. "It's always important to go to your locals and always try to compete. NLBC has all the best players in the United States, it's a great place to train and build your image. Playing at Battle Circuit helped build the image and got me to compete at ELEAGUE. Go to your locals."